Freelancers: How Do You Get Paid? A universal goal of freelancers and other business owners is to get paid for the work we do quickly and in full. There are several general payment options you can offer to your clients, each with their own positives and negatives. Plus, there are a number of things you can do to make it easier for clients to pay you, and pay you on time. 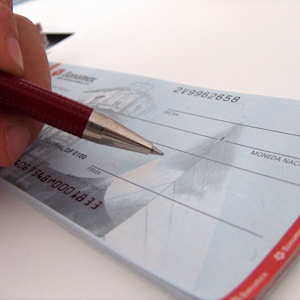 Check â€“ Accepting business or personal checks is a very common way of getting paid for your work. The biggest challenge is having to wait for the check to arrive in the mail and then for it to clear in your account. PayPal â€“ Many freelancers accept payment via PayPal and other similar services. This can provide instant payment and only requires the client to complete a short online process to send payment. The biggest downfall is the third-party transaction fees that get deducted from your payment. Credit Card â€“ If you have a merchant account and are set up to take credit card payments, this is a great option. It allows clients to pay via credit card and you can even process the payment yourself if you have a standing agreement with your client. Again, there are fees incurred for the benefit of instant payment. Wire Transfer â€“ A wire transfer is not a very popular payment option, but it also provides payment much quicker than a check. Of course, you will have to share your bank information, including your account number, which doesn’t appeal to many people. And, of course, there is also a wire fee. Money Order â€“ Paying via money order requires that the client goes to a third-party, such as a bank or post office, to purchase it and then it can be mailed to you. This is also not a very popular method, but it is a valid option for those without the ability to pay by check. Regardless of the methods of payment you offer to your clients, there are a few ways to put yourself in a position to get paid when you expect to be paid. The first step is creating standard and consistent billing practices. If you bill the same way at the same time each month, it will be easier for both you and the client to plan ahead. You should also outline your billing practices in your contract, and review them with the client as necessary. If you find that late payment is a problem you frequently face, you may consider instituting penalty fees for missed or late payments. Again, this should be outlined in your contract and discussed with your client so there no confusion. Depending on the type of projects you do, deposits are another way to ensure you get paid. You can require your clients to pay a portion of the total cost up front, and then set milestones for additional payments. If you are particularly worried about receiving payment, you can also wait to begin any work until the initial deposit has been received. Lastly, you can also consider offering a payment plan option. However, this may not be a viable alternative unless you have an established relationship with the client. If a long-term client experiences unexpected financial hardship, a payment plan can ease their financial burden while helping to ensure you get paid, even if it is in smaller amounts spread over a specific period of time. How do you get paid for your work? What other options would you consider? Image credit: Jeinny Solis S.